Not familiar with the PHEV term? Join the club. It’s an acronym that puzzles many car buyers when it’s mentioned. 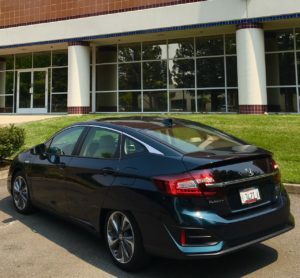 Like the Chevrolet Volt, the 2018 Honda Clarity Plug-in Hybrid (PHEV) features an internal-combustion engine that’s utilized as a generator to charge the batteries for an electric motor that primarily drives the vehicle. A typical hybrid, like the Toyota Prius, uses a gas engine and electric motors that connect to the transmission to get the vehicle in motion. The 2018 Honda Clarity has a 48-mile range when in EV mode. Charging takes 2½ hours from a 240-volt station and 12 hours from a standard 120-volt wall plug. There are three versions of the front-wheel drive Clarity, a relatively new sedan in the Honda lineup. The Japanese automaker is offering the Clarity as an electric vehicle (EV), a fuel-cell model, and a plug-in hybrid electric vehicle (PHEV) that will be the primary focus of this review. The fuel-cell Clarity is an electric motor that draws its power from a hydrogen fuel cell. It’s available only in California and is offered for lease only. The EV model can be leased in just California and Oregon. The PHEV has the most mass appeal in the Clarity lineup. It has a solid electric range, delivers adequate performance, provides excellent mileage, and is a sedan that folks will find comfortable and with good road manners. Introduced in 2018, the Clarity PHEV starts at around $34,400, which is several thousand less than the popular Honda Accord Hybrid. If applicable, the $7,500 federal tax credit adds another incentive for buying the Clarity. The Clarity PHEV has a 48-mile range when in EV mode, meaning it will get many people to work and back each day. Charging takes 2½ hours from a 240-volt station and 12 hours from a standard 120-volt wall plug. The overall range for the PHEV is approximately 340 miles. We found the Clarity PHEV providing better performance than expected. It has a 17-kilowatt lithium-ion battery and employs a 1.5-liter, four-cylinder gasoline engine that’s paired with an electric motor hybrid. Combined they generate 212 horsepower and 232 pound-feet of torque. The PHEV goes roughly 0-60 mph in 7.7 seconds when fully charged. It gets the equivalent of 110 mpge in EV mode and 40-44 mpg overall. What is tricky to accomplish is keeping the Clarity in true all-electric mode and expect major acceleration. A big push of the accelerator will immediately flip the Clarity into hybrid mode so the vehicle can receive the needed power. The PHEV comes with three drive modes – Econ, Normal and Sport. The Clarity has paddles on the steering wheel that are not used for the traditional shift to manual transmission. These paddles are all about the regenerative braking. And the paddles are easy to master. Just pull on the left paddle for more braking and the right one for less. Although the back seat will feel a bit cramped, the Clarity cabin can transport five people. There’s ample room up front and the cargo area is suitable as well with 14.8 cubic feet in the trunk. The 8-inch touchscreen is a little less sophisticated than expected and some of the basic functions can be difficult to use. The Clarity does support Apple CarPlay and Android. We’re impressed by Clarity PHEV for its overall package and suspect Honda may have another solid car to add to an already impressive lineup.